In my story, The Hope Chest, part of the 12 Days of Heartwarming Christmas, Evelyn Marshall is a buyer for Dockery’s Department Store and a personal shopper in Christmas Town. She tends to shop for people even when they don’t ask for her services. Clothes simply speak to her. Evelyn would have loved it if she could have been at New York Fashion week last month. Here are three takeaways from this year’s Fashion Week that Evelyn would encourage everyone to put into their holiday wardrobe. Animal print – Now, not everyone wants to be dressed head to toe in zebra print, but a little can go a long way. Shoes or handbags are a great way to use animal print. If you’re feeling a bit more wild, you could try a jacket like this one from Chico’s. You can totally simplify it by adding a black pencil skirt or black jeans. Red – This one is easy. Who doesn’t like to wear red around the holidays? Again, you could make a bold statement and go all red with a dress or cute jumpsuit or you could use it as an accent in smaller ways like shoes or even earrings! 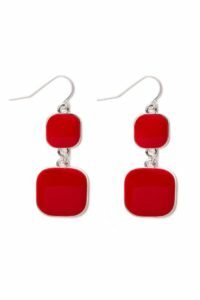 I love these from Charming Charlie’s. Plaid – Plaid is all the rage this season. You can mix it up and wear different colored plaid pieces together or try something timeless like a plaid blazer paired with jeans. In The Hope Chest, Evelyn buys Felix a buffalo plaid button-down shirt because when she sees it at the story, she immediately thought of him (maybe it was the shirt, maybe it was her growing feelings!) This is a great way to fit a two-for-one fashion trend (red and plaid) into your wardrobe! Check out this one from Old Navy!